"1 photograph; 25.2 x 25.5 cm. 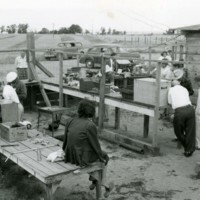 Large machine with the name Head Mechanical INC. on it and three men all looking at what machine is moving." 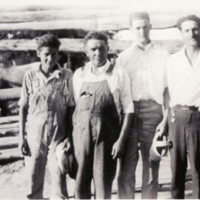 Four men standing side by side posing." 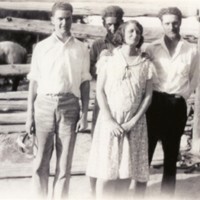 Three men and one woman posing for a picture." "1 photograph; 25.3 x 27.7 cm. 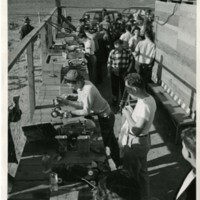 Men working at wooden tables on model cars and others in background also. 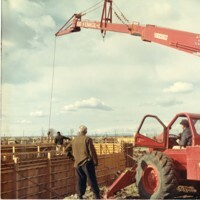 Text on back of image reads: ""Robley L. Johnson Photo""." "1 photograph; 12.9 x 17.8 cm. 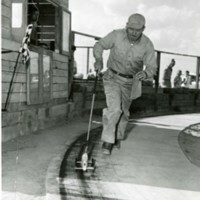 Man in motion pushing model car with a rod connected to it. 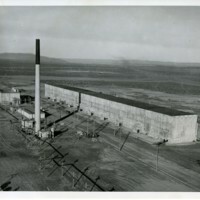 Text on back of image reads: ""Date 8-8-48; Re-order No. 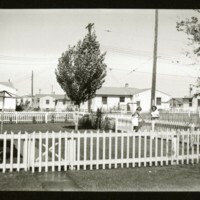 3688 #2; Robley L. Johnson Photo""." 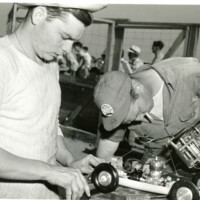 Man with model car in hands on top of a table. 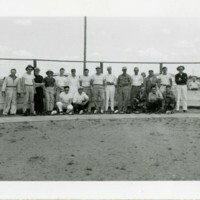 Text on back of image reads: ""Date 8-8-48; Re-order No. 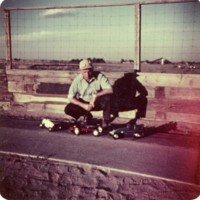 3688 #1; Robley L. Johnson Photo""." "1 photograph; 12.8 x 18 cm. 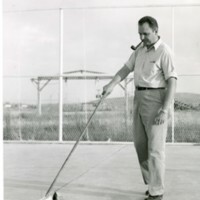 Man touching model car with rod with a pipe in his mouth." "1 photograph; 6.4 x 9 cm. 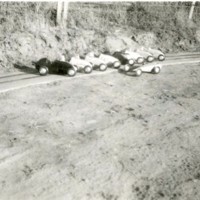 Multiple model cars lined up in the dirt." 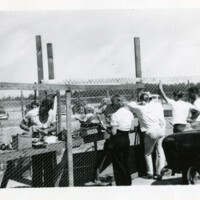 People at fenced in area working on model cars and doing other things." 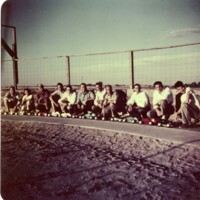 "1 photograph; 8.2 x 11.6 cm. 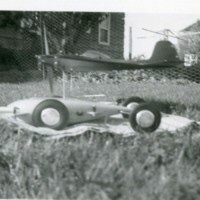 Model cars are sitting on table and other people are standing near." "1 photograph; 6.7 x 9.1 cm. 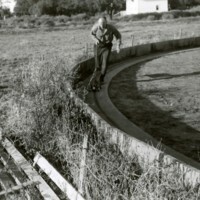 Man in circle track pushing model car with rod." 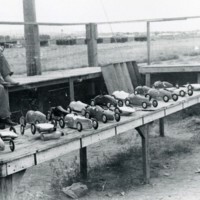 Man is posing looking at one of three model cars in front of him." "1 photograph; 8.8 x 13 cm. 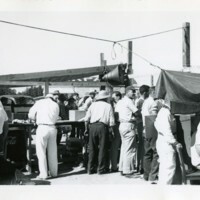 Several men, and a woman and child in the scene, one man working on model car." "1 photograph; 8.3 x 13 cm. 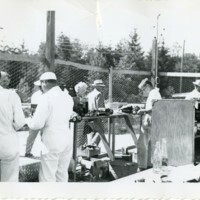 Several men in fenced area working on different tasks and looking around." 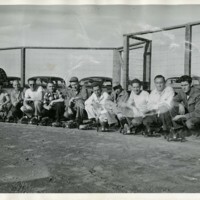 Several men in a caged in a fenced in area working on model cars." "1 photograph; 8.2 x 11.5 cm. 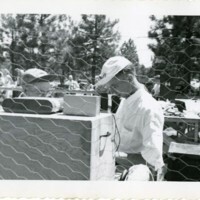 Two men looking at rectangle object with other men and trees in the background." "1 photograph; 23.8 x 17 cm. 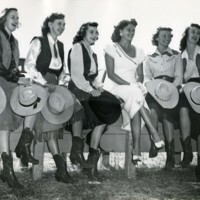 Eight Women sitting on a fence posing for a picture." 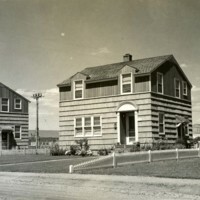 "3 photographs; 5.1 x 7.7 cm. Women talking over a picket fence. One print, one copy negative, one negative." 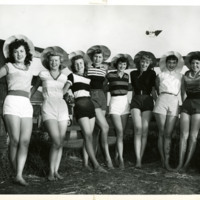 View of eight young women, Atomic Frontier Days 1954 queen contestants, in striped shirts, shorts, and sun hats, standing next to a tall fence. 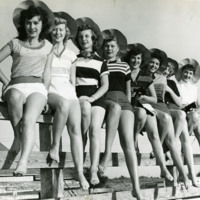 View of eight young women, Atomic Frontier Days 1954 queen contestants, in striped shirts, shorts, and sun hats, sitting on a fence.